Comments: Riding the 'cars' in 1914 was still a popular mode of travel, as shown in this photo at Scottsville Depot. 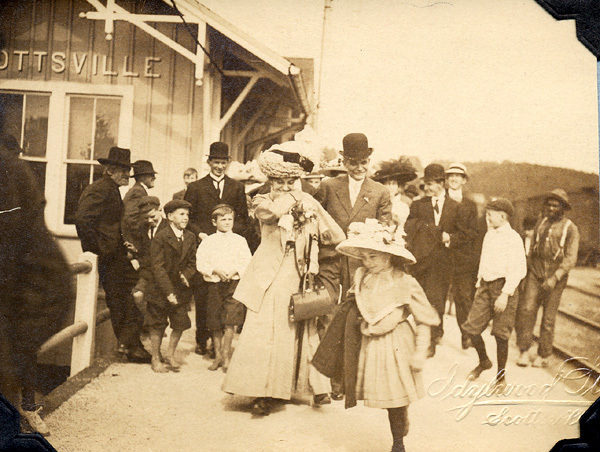 Burgess captured the William Day Smith family arriving on the Richmond passenger train. Note the throng of townspeople gathered at the depot to watch the train arrive, a Scottsville custom that may date back to the late 1800's when seeing 'cars' drawn by a steam engine was a sight to behold. William Day Smith and Annie Parker Harris were married on June 3, 1910, and were the parents of two children: Charles William Smith and Frances Crafton Smith (b. 1912). Annie Parker Harris was born September 19, 1880, in Scottsville, VA, and was the daughter of Charles Bascom and Helen (Crafton) Harris, Sr. Her maternal grandparents were Miletus Ballard and Frances Caroline (Grubbs) Harris. Miletus Harris was a Scottsville merchant, who arrived in Scottsville in 1837 and lived on Harrison Street next to the Scottsville Baptist Church. This photo and Harris family genealogy was provided courtesy of Mimi Hill Erb of Roanoke; Mimi is a descendant of the Harris, Hill, and Patteson families of Scottsville.